Changing the Canadian Wheat Board, Part III: The End of the Wheat Board: What next? March 9, 2012 March 9, 2012 1 Comment on Changing the Canadian Wheat Board, Part III: The End of the Wheat Board: What next? Wheat. The Golden Crop of the west, what was once the backbone of prairie farms, is facing a new/old future. Perhaps the low-carb diets and labeling of wheat as a potential allergen in food products (bread: may contain wheat!) is tearing into wheat’s popularity and profitability? Not really. World population is growing exponentially, and wheat still packs a commercial punch – it is highly portable, easy to store, and full of potential food energy. What’s new is the way that western Canadian farmers will market their product to that vast, faceless, hungry world population. The Canadian government, in a move that splits the farm community along viscerally divisive lines, has ended the 70 year monopoly of the Canadian Wheat Board. Critics and proponents of the Wheat Board – in letters to editors of various national, regional, and special interest newspapers, in blog posts, in corporate press releases, in political speeches, and in small-town coffee shops and cold hockey arenas – spent the fall of 2011 in a flurry of decisions, court injunctions, and media manipulation. Just search ‘Canadian Wheat Board’ in your internet search engine under ‘news’, and you can spend the rest of the day viewing both sides of the discussion. You’ll see everything from erudite and precise legalese to the kinds of words associated with all-out barroom brawls. The most divisive spread seems to be political: a Conservative government has made no bones about its intention to dismantle the CWB, and has been attempting to do so (and has been both thwarted and supported) since 2006. Legal battles abound; constitutionality has become both an issue and a potential crisis. What, you might ask, is the Canadian Wheat Board, and what was its purpose? The short answer is, the CWB was essentially a single desk grain buyer for all of the wheat and most of the barley grown in western Canada (Manitoba, Saskatchewan, Alberta, and the Peace River region of British Columbia). 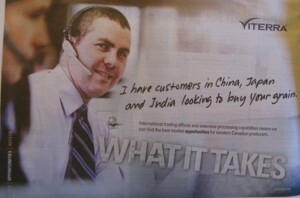 The CWB in turn acted as a marketing agent on the world market. From the farmgate perspective, it worked like this: you grew wheat on contract with the Canadian Wheat Board. When you delivered it to the elevator (no matter which one), you received an initial payment and your wheat went into a particular ‘pool’ depending on the date you brought it in, the type of grain (hard red spring wheat, durum, etc.) and its grade. That initial payment was guaranteed by the federal government, which provided base financing until the Wheat Board was able to sell the grain to a buyer. Interim and final payments would bring the farmer’s total to 100% (minus, of course, selling fees, elevation and freight fees, and other check-offs). If you were a farmer in Ontario or Quebec, or elsewhere, you were not required to sell to the Canadian Wheat Board. And therein lies the sting: why is there a double standard? Are western Canadian farmers such poor marketers that they require a single desk seller to market their collective product? So, Bill C-18, “An Act to reorganize the Canadian Wheat Board and to make consequential and related amendments to certain Acts”, otherwise known as the “Marketing Freedom for Grain Farmers Act” passed the now-majority Conservative Parliament and was given royal assent on December 15th, 2011. The CWB will cease to operate as a single desk buyer for western cereal crops on August 1st, 2012 – just before the next harvest begins. From the farmgate, the question swings into a whole new dimension: what now? The CWB still exists; and, for the next five years, its pooling prices will be guaranteed by the federal government. What was once a single desk, though, now has to compete on the open market – and it won’t be an even playing field. With no elevators, terminals, or grain handling facilities, the CWB is busy ‘negotiating’ with grain companies to allow it room to manoeuver. Grain companies, delighted with the CWB’s changed status, expect higher profits — now might be a good time to buy shares in Cargill and Viterra. Yet, profits for private companies irk the farm community and push farmer’s trust back onto the CWB (even in its new, untested format). 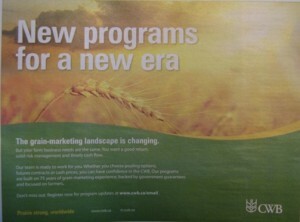 The CWB has another option for reinventing itself. A revised suite of marketing programs, which addresses forward planning, hedging, and professional crop sales advisory roles, has been introduced. If the new order works out, the CWB could potentially expand to marketing oilseeds and pulses, as well as grains. 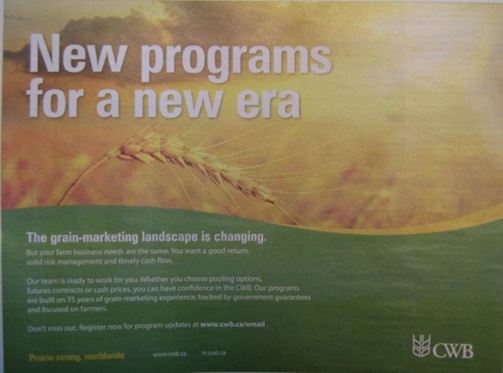 But they have competition: marketing advisors are popping up everywhere, promising to sell your grain profitably. And some will no doubt be successful. Around the kitchen table at our farm, we’re planning our next crop year, but with wary eyes in all directions. Contracts being offered from grain companies sound good, but they don’t have enough information on prairie shipping premiums, foreign exchange, or grade dockage. We forward contract canola, but wheat – with its increased risks due to frost, pests, wet years, dry years, hail, and a myriad of other environmental issues – is a tough crop to predict with any degree of confidence. Signing a contract promising to deliver no. 1 wheat is an incredible risk. So, uncertainty reigns. And, it will for at least another eighteen months, until the new system works itself through one full crop year, and farmers have a chance to analyze their options in full. This is the third part of a three-part series on the history of the Canadian Wheat Board and the implications of the recent policy changes of the federal government concerning the CWB.